Please feel free to add a comment on the site, request further material, recommend a site to visit or ask a question: I will, providing I know, answer the questions on the Guestbook and if you fill-in your email address, I hope other readers will chip-in with answers too! Only just discovered this website - what a gem ! Looking at the old photos makes you think - Why didn't I take more photos at the time ? Simply because you didn't see a need to - you thought the stations and locomotives would be there for ever. I lived between Wrexham and Chester and loved to travel on the Birkenhead - Paddington expresses in the early '60s. Only six coach trains from Chester usually but made up with a further rake, including a restaurant/buffet car, at Wolverhampton Low Level. Engine change as well of course, usually to a King. I remember well the white painted slogan on the brewery wall as you approached the Low Level station 'Butlers Ales - Pride of the Midlands' Arrival at Snow Hill was always something special - a great station, sadly missed. I have recently acquired a couple of jig-saw puzzles depicting Snow Hill in steam days which I am looking forward to completing. The replacement station does nothing for me I'm afraid - I've visited it a couple of times but find myself just standing there trying to imagine what it used to look like. Very sad. Sometimes I used to get off the train at Snow Hill and have a look around Birmingham and sometimes I went through to Paddington. After a quick bite to eat in London I used to board the next available service back and I usually stood in the corridor by a open window for most of the time (both ways). Needless to say I was rather tired and face-blackened with my hair full of bits of soot when I finally arrived home but it had been worth it. To be by an open window as the train raced through stations with the sound of the engine steaming hard being amplified by the platform roof - words can't adequately describe it but if you've done it you'll appreciate what I'm saying. Many thanks to the Webmaster and best wishes to all lovers of this former Great Western main line. This is a fantastic site which I shall spend many hours visiting. I am particularly interested in Dudley station (note the surname) which I remember as a child, when sadly it was coming to the end of its useful life. My ambition, time and energy permitting, is to recreate a working model of it in it's heyday, and although I have some memories and old photo's, I need track and signalling plans, building plans, timetables etc.. so would be grateful of any contributions in this regard. A fascinating site. Some really interesting info. One of my earliest memories is standing on the platform at Soho & Winson Green Station watching steam engines thundering past - 50 or so years ago.! I've just spent a fascinating 2 hours on this site. As a steam fan and former train spotter what memories it brings back. Great work and many thanks ! Very fond memories of my walks around Birmingham and her disused railways in the early 1970s (enjoyed the railways more than the course material at Brum Uni..). Good to see that the powers that be finally woke up to the opportunities afforded through revitalising Selly Oak Station and others. Thank you Brum for being a friendly city. Tarra a bit for now, then, our kid! OOPS! Cancel that last request. Made an idiot of myself, I've found it now, Duh! I have noticed that your "validation code" doesn't seem to change...weird. Hi there, I\'m really enjoying the vast resource that is your incredible site, however on your regional map I can\'t find Cutnall Green. Could you put it on the map please? Hello there! 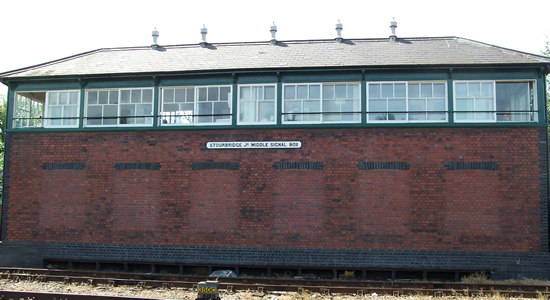 I am quite a fan of this site, and I find it very informative about local history by rail. I am confused about one thing though. You say that Deepfields is served by trains from Wolverhampton to Coventry via Snow Hill? I thought Snow Hill was only served from Low Level, and the Stour Valley Line doesn\'t go to Snow Hill does it? Or is it just an error? Greetings from California. Your glorious photograph of the entrance to the beloved old Snow Hill Station has prompted me to send this message of thanks for your terrific site. My mother would only go to holiday resorts if she could begin the journey from Snow Hill. After I left school, I had two jobs in Birmingham. The first was in Livery Street and the later one in Colmore Row, so I was more than familiar with the old station. I was saddened when it came to an undeserved and ignominious end. The recently inaugurated Snow Hill station doesn't quite do it! Well, while my mother loved Snow Hill, I have to confess I had a fondness for New Street Station--before it was Hitlerized. I seem to remember that it was fascinating to walk across the old passenger pathway and look down on the trains and tracks below with all that gorgeous steam and smoke. (Could I have been doing that when we were walking from New Street to Station Street and the Old Rep Theatre?) I also have fond memories of Smethwick Rolfe Street (from my Holly Lodge days)and Nottingham and Leicester stations(from my army days.) I avoided post World War II New Street Station and the traffic of central Birmingham whenever possible, so visits to the U.K. usually meant: Heath Row, Euston and quite good service to Birmingham International. Finally,I hope the new discussions for high speed rail service will include an improved New Street station. Birmingham deserves to be included in such an important service. That statement was supposed to bring this rambling note to a more or less fervent conclusion, but, if you will indulge me for one moment more--I would just like to mention that I have been most pleased with the Heath Row-Paddington rapid service inaugurated just a few years ago. Again, thanks for the site, especially in its new manifestation. Cheers!